Scroll down to see the top not-for-profit colleges offering criminal justice degrees online. Albany Technical College offers four online programs for students interested in pursuing a career in the criminal justice professions. The Associate of Applied Science in Law Enforcement Technology degree is a 60-credit program that requires students to complete 30 credits in the major (including an internship or practicum experience that counts for three credits), plus 15 credits from an approved list of criminal justice electives. Some of the required courses for the degree include the following: Constitutional Law and Criminal Justice, Principles of Law Enforcement, and Juvenile Justice. The college also offers a 39-credit Law Enforcement Technology diploma. At the current time, there are two Technical Certificate of Credit programs available - Criminal Justice Specialist (15 credits) and Homeland Security Technician (12 credits). The Department of Emergency Administration and Management (EAM) at Arkansas Tech University offers two online programs in the field - Bachelor of Science in Emergency Management and Master of Science in Emergency Management & Homeland Security. The programs are accredited by the Foundation for Higher Education in Disaster/Emergency Management and Homeland Security. In addition to the General Education requirements (37 credits), students admitted to the Bachelor of Science program must enroll in the following: technical specialty courses (42 credits), administrative or professional courses (15 credits), and interdisciplinary courses (21 credits). In order to graduate from the program, MS students have the option of writing a thesis, completing a practicum experience, or enrolling in specialized elective courses that support their professional goals. Bethel University offers Associate of Applied Science (AAS) and Associate of Arts (AA) degrees in criminal justice that can both be pursued online. The AAS program is designed for students who plan to enter the criminal justice workforce immediately after earning the degree. The AA program prepares students to pursue work opportunities in the field as well, but also lays the foundation for further baccalaureate study. Bethel University offers an online Bachelor in Criminal Justice degree that is comprised of 48 credit and designed for working professionals with a minimum of 30 hours of previous college credits. On the graduate level, the university offers a Master of Science in Criminal Justice degree. A 36-credit program, the MS degree is also available online. The Associate in Science degree in criminal justice technology offered at Eastern Florida State College prepares students with minimal criminal justice work experience for entry-level opportunities. Students with professional criminal justice background or experience are prepared for advancement in the field. Most of the AS credits can also be transferred to four-year baccalaureate programs offered in large universities. Students enroll in major courses (criminal law, criminal justice administration, criminal procedures, etc.) as well as in technical courses (crime scene technology, community corrections, crime scene safety, etc.). By taking carefully-selected electives, students can craft a customized program that supports their career goals. Applicants who have completed the Florida Department of Law Enforcement (FDLE) Officer Competency Exam may be eligible for college credits. Broward College offers an Associate of Science degree in criminal justice through the Institute of Public Safety. The AS degree is comprised of 60 credits and can be pursued online. Students admitted to the program must complete 42 core requirement credits, which include courses in criminal investigation, constitutional law, general psychology (or sociology), human behavior, and professional or technical writing. Students can customize their learning experience by fulfilling the 12-credit elective requirement in the criminal justice field that focuses on their area of interest (homeland security, corrections, criminal law, etc.). The AS degree prepares students without prior criminal justice experience for entry-level work in the field, while active professionals gain additional credentials for advancement in their current line of work. The Protective Services Department at Central Texas College offers an Associate of Applied Science degree in criminal justice that can be completed online. Students have the option of pursuing the general AAS in Criminal Justice degree or the AAS in Criminal Justice - Corrections degree. Central Texas College follows the common course transfer core curriculum in criminal justice, making the AAS credits easily transferable to a four-year program in a large university. The 67-credit program includes coursework in the juvenile justice systems, criminal investigation, court systems and practices, and ethics in criminal justice. There is also an online, 30-credit Certificate of Completion in Criminal Justice Studies available. As with the AAS degree, the certificate offers a specialization in the field of corrections. Central Washington University offers a Bachelor of Arts degree in law and justice that prepares students for professional employment in the criminal justice field, such as law enforcement or corrections. The program also provides adequate preparation for graduate studies or law school and can be pursued online. Students must complete 32 credits (8 four-credit courses) in the major. The required coursework includes courses that cover topics such as community and social justice, crime in America, research methods in criminal justice, criminal procedure, and ethics, diversity, and conflict in criminal justice. Students must also complete the foreign language requirement of the Bachelor of Arts program that is the equivalent of a first-year college level proficiency (or two years at the high school level). Chaminade University currently has three degree programs in criminal justice available online: Associate of Science, Bachelor of Science, and Master of Science. The 60-credit AS program prepares students for employment opportunities in the field immediately after graduation. Students who plan to transfer their AS credits to a four-year bachelor program should enroll in courses that will satisfy the additional requirements of the bachelor's degree. The BS in Criminal Justice program has a pre-law track for students who plan to proceed to Law School when they graduate. Students accepted to the MS program can choose law enforcement or corrections as their area of concentration. A third option (hybrid) provides MS students with a broad-based, foundational perspective of the criminal justice system. Columbia College offers Bachelor of Science and Bachelor of Arts degrees in criminal justice administration. At the current time, only the Bachelor of Arts program is available online. The curriculum includes coursework in cultural diversity in criminal justice, laws of criminal evidence, management of criminal justice agencies, and the juvenile justice system and procedures. An Associate of Science in Criminal Justice Administration is also available online. Columbia College offers an online Master of Science in Criminal Justice Administration that emphasizes the following basic areas: trends in criminal justice, policy development and analysis, research design, and ethics in criminal justice. Students can further customize their degree by choosing a management track in one of two fields - law enforcement and administration or corrections administration. Students admitted to the Associate in Applied Science in Criminal Justice program at the Community College of Philadelphia have the option of pursuing the degree online. The program prepares students for professional opportunities in the field immediately after graduation, however, AS credits also transfer readily to four-year baccalaureate programs in large universities. The college has articulation agreements in place with several universities that facilitate this transfer. Students are required to take the following courses: Survey of Justice, Juvenile Justice, Criminal Law and Contemporary Issues in Justice. Additionally, students must enroll in five electives, which are organized along four career clusters. Each cluster focuses on a specific criminal justice field: police, corrections, parole and probation, and corporate and homeland security. The College of Justice and Safety at Eastern Kentucky University offers an online Bachelor of Science in Criminal Justice program with a focus on adult corrections and juvenile justice. Students are required to complete 45 credits in the major that includes courses such as criminal justice ethics, perspectives on crime and delinquency, rehabilitation strategies for adult and juvenile defenders, and addressing the mental health needs of offenders. The university offers a Master of Science in Justice, Policy, and Leadership degree that can be completely entirely online. Students accepted to the program can choose from the following concentration areas: police policy and leadership, corrections policy and leadership, and juvenile justice policy and leadership. The MS program requires the completion of 30 graduate-level credits. The School of Public Service at Excelsior College offers three online degrees in criminal justice: Associate of Science, Bachelor of Science, and Master of Science. Students are allowed to transfer up to 57 credits to the AS program and some types of military training or work experience may qualify for academic credits as well. The Bachelor of Science in Criminal Justice program can be completed without a concentration. However, students can select one of the following areas of concentration: criminal justice administration, homeland security, investigative forensics, and law enforcement and public safety. Students can pursue the MS degree also without a concentration, or choose one of two concentration areas currently available in justice administration and in homeland security and emergency management. Florida Atlantic University offers a completely online program leading to a Bachelor of Arts in Criminal Justice. To earn this degree, students must complete 120 credits, including 30 credits in upper-level criminal justice coursework. Students take three core courses and at least seven electives in junior- and senior-level criminal justice classes. Classes have an asynchronous format so students can do their coursework at the time that suits them. FAU's criminal justice faculty members have a range of professional experience in criminal justice. The university also offers an online Bachelor of Public Safety Administration, with specializations in law enforcement and disaster management. This program is designed for students seeking a career in police, fire, and disaster response administration. The Steven J. Green School of International and Public Affairs at Florida International University (FIU) offers a Bachelor of Science in Criminal Justice degree that can be pursued entirely online. In addition to completing the university core curriculum and the academic requirements of the College of Arts, Sciences, & Education, students must take 24 credits of criminal justice core subjects and 12 credits from the approved list of elective courses. On the graduate level, FIU offers a Master of Science in Criminal Justice degree that can also be completed online. MS students are required to complete the following courses: Criminological Theory, Research Methods in Criminal Justice, Data Analysis in Criminal Justice, Transnational Crime and National Security, and Criminal Justice Policy Analysis. Applicants for the online Bachelor of Science in Criminology program at Florida State University must already have an Associate of Arts degree in order to be considered for admission. The 36-credit degree completion program requires no on-campus visits. The university also offers an online Master of Science in Criminal Justice degree that has been ranked as No. 5 in the nation by U.S. News & World Report (2016). MS applicants with five or more years of professional experience in the criminal justice (or related) field do not have to take the GRE to be considered for the program. Students must complete 15 credits of core courses, 12 credits of electives from the approved criminal justice list, and 9 credits of free electives. Hartnell College offers an Associate of Science degree in administration of justice that can be completed entirely online. The curriculum includes courses that cover topics such as the theory and practice of law enforcement, correctional science, illegal narcotics and dangerous drugs, and peacekeeping strategies in multicultural communities. At the current time, there are two programs available - a regular two-year AS degree and a Fast Track program that can be completed in three semesters (one calendar year). Courses in the Fast Track program are only six weeks in length, although they are given the same credit as 18-week courses. Students who have graduated from recognized academies as police or correctional officers automatically receive 12 credits towards the Fast Track AS program. The Associate of Science in Criminal Justice degree offered at Ivy Tech Community College is a T-SAP (Transfer - Single Articulation Pathway) program. This means the degree readily transfers to a four-year baccalaureate program in a related field offered at a large university. Students can customize their learning experience by choosing an area of concentration and enrolling in electives that support their field of interest and career plans. At the current time, the following fields of concentration are available: corrections, forensics, law enforcement, and youth services. A total of 60 credits is necessary for the degree and students have the option of completing the program online. The curriculum includes coursework in cultural awareness, criminal law, ethics in criminal justice, and introduction to corrections. Kaiser University offers two programs in the criminal justice field - Bachelor of Arts (BA) in Criminal Justice (120 credits) and Associate of Arts (AA) in Criminal Justice (60 credits). Both degrees can be pursued online. The BA curriculum prepares students for employment and advancement in the field, as well as further studies on the graduate level. Upper division coursework covers a wide range of topics including deviant behavior, terrorism, forensic science, technology and crime, constitutional criminal procedures, alternative punishment, and organized crime. The AA degree gives students the opportunity to study the major components of the criminal justice system in the United States, including law enforcement organizations, criminal behavior patterns, juvenile systems, and the fundamentals of criminal investigations. The Helms School of Government at Liberty University offers an online Bachelor of Science in Criminal Justice degree with the following areas of specialization: business administration and management, criminal psychology, crime scene investigation, homeland security, public administration, strategic intelligence, and juvenile justice. Active law enforcement officials as well as military personnel may be able to earn credits towards the degree based on their educational background and/or life experience. On the graduate level, Liberty University offers two online Master of Science (MS) degrees - MS in Criminal Justice and MS in Criminal Justice - Public Administration. Both programs offer a thesis and non-thesis option. Criminal justice administration is also available as an area of specialization for the online Master of Business Administration degree. Lindenwood University offers a Bachelor of Arts in Criminal Justice degree that can be pursued online. The program provides students with a fundamental understanding of the criminal justice system, including policing, corrections, the courts, and criminal procedures and investigations. To complete the 128 credit hours required for the degree, students must take 50 credit hours of General Education courses, 45 credit hours of core courses, and 30 credit hours of criminal justice courses. The curriculum includes coursework that cover several key issues in the field of criminal justice today, such as criminal law, white collar crime, policing, victimology, the juvenile justice system, and race, crime, and punishment. Students are required to complete an internship experience in order to graduate from the program. Students accepted to the online Bachelor of Applied Science in Public Safety Management program at Miami Dade College have the option of pursuing the criminal justice track. The program requires the completion of at least 30 upper-division credits from an approved list of courses that include the following (among several others): judicial policy making, female crime and delinquency, crime prevention, and police and society. Miami Dade College offers an Associate in Science (AS) in Criminal Justice Technology degree that can also be pursued online. The AS program prepares students to enter the workforce in the criminal justice field immediately after graduation. Students who plan to transfer their AS credits to a four-year baccalaureate program may need to fulfill additional requirements. National University offers an online Bachelor of Science in Criminal Justice Administration degree that prepares students for a variety of entry- and advanced-level positions in the criminal justice field. Upper division coursework include classes in forensic science, juvenile justice, civil and criminal investigations, corrections, and leadership and management. Academically qualified students can take advantage of transition programs designed to facilitate the transfer of some of their undergraduate credits to a Master's program in the following fields: forensic science, public administration, juvenile justice, and criminal justice. These transition programs reduce the credits required for the master's degree to 10 (from 12 or 11), thereby making it possible for students to earn both degrees in a shorter span of time. New Mexico State University has two criminal justice degrees available to online students. The online Bachelor of Criminal Justice is a degree-completion program that requires students to have met all the lower-level degree requirements before entering the program. The Master of Criminal Justice is a 36-credit focused coursework program that is designed for three kinds of students: those who plan to teach or conduct research in the discipline; those employed in the field who need additional training for career advancement; and students who want to start a career in criminal justice. Applicants must have a bachelor's degree with a GPA of 3.0. Master's students start the program in the fall semester. The Bachelor of Science in Criminal Justice degree that North Carolina Central University offers completely online is designed as a degree completion program. Applicants who have already earned an associate's degree from an accredited community college are highly preferred. Students are admitted to the program at the beginning of the fall and spring semesters. The program consists of 57 credit hours with courses delivered in 16-week sessions. At the current time, there are three areas of concentration available online: law enforcement, homeland security, and corrections. Online courses at North Carolina Central University are offered synchronously. The program is certified by the Academy of Criminal Justice Sciences, which is the largest association of colleges and universities in the field of criminal justice. Penn State offers an ACJS-certified online Bachelor of Science in Criminal Justice and an online Master of Professional Studies in Criminal Justice Policy and Administration. The online bachelor's program is a judicious mix of theory and practice, with upper-level courses in areas such as police administration, the juvenile justice system, and border security. An internship with a criminal justice agency is required. Students can also elect to pursue an 18-credit homeland security minor as part of the degree. The leadership-focused online master's program emphasizes social science and policy. Students must complete 18 credits of core courses (e.g. criminal justice institutions, criminal procedure, advanced statistics, etc. ), but they have the freedom to choose 9 credits of advanced electives (e.g. American correctional system, policy analysis, sentencing, law and society, etc.) and the project topic for their capstone. Graduates are primed to bring new evidence-based practices into their jobs at criminal justice or legal organizations. Rio Salado College offers an Associate in Applied Science (AAS) in Administration of Justice degree that is comprised of 61-66 credits and can be pursued online. Most students earn the degree in six semesters. The program gives students the opportunity to study diverse communities and populations in-depth and how they impact the criminal justice system. The curriculum includes coursework in substantive criminal law, constitutional law, criminal investigations, criminal justice report writing, criminology, and procedural criminal law. Each course is eight weeks long and available asynchronously online. The college also offers a Certificate of Completion in Administration of Justice degree. This 30-credit program is available online as well, and designed for students looking for broad-based instruction and training in the criminal justice field. The online Bachelor of Arts in Law and Justice program at Rowan University is a degree completion program that requires applicants to have an associate degree or 24 semester hours of transferable college credits. The 60-credit, full-time program prepares students for professional careers in four principal areas: corrections, court services, human services, and law enforcement and security services. Each course is delivered in 8-week modules. Rowan University offers a Master of Arts in Criminal Justice program that can be completed online as well. The MA program follows a part-time plan of study and offered in an accelerated format. The completion of 30 graduate credits is required for the degree, and most students graduate from the program after five consecutive semesters of enrollment. The School of Education & Social Services at St. Leo University offers a Bachelor of Science in Criminal Justice degree that can be pursued online. Students admitted to the program can choose to specialize in one of two fields - criminalistics or homeland security. The university offers a Master of Science in Criminal Justice degree with the following specialization areas: corrections, critical incident management, forensic psychology, forensic science, and legal studies. There is an online 18-credit Graduate Certificate in Criminal Justice Management program available. The program is designed for students who wish to increase their knowledge and training in the field, without having to pursue a full-blown master's program. An Associate of Arts in Criminal Justice is available online as well. Sam Houston State University was ranked No. 1 for online graduate criminal justice programs in 2017 by U.S. News & World Report. The Master of Science in Criminal Justice is a 36-credit program that allows students to start in the spring or fall semester. This is a terminal degree that is not intended for students who want a Ph.D. The online, 36-credit Master of Science in Criminal Justice Leadership is for professionals in the field and is appropriate for possible Ph.D. candidates. Undergrads can earn a Bachelor of Science or a Bachelor of Arts in Criminal Justice online. The BS requires more social science classes while the BA requires more credits in a foreign language. South Texas College offers an Associate of Arts in Criminal Justice degree that can be pursued entirely online. The 60-61 credit program is designed primarily for students who plan to continue their studies in a large university to pursue a four-year bachelor's degree in criminal justice or a related field. However, students who complete the program are also prepared to enter the workforce immediately after graduation in various criminal justice fields (community correctional programs, juvenile agencies, protective services, private security, etc.). In addition to completing the General Education requirements, students must enroll in the Introduction to Criminal Justice class in their first semester. They must also take a three-credit criminal justice elective each semester (two in their last semester). Students pursuing the online Bachelor of Science in Criminal Justice program at South New Hampshire University can choose from the following areas of concentration: corrections, criminology, homeland security and terrorism, human services, legal studies and advocacy, and police administration and operations. Up to 90 credits can be transferred from an accredited program towards the degree and courses are accessible 24/7. There are more than six 9-week terms each year. The Master of Science in Criminal Justice degree offers concentrations in advanced counterterrorism and in public safety administration. An Associate of Science in Criminal Justice degree is also available online, in addition to several certificate programs that are criminal justice-related, such as policing and law enforcement and law and the legal process. The Associate in Science (AS) in Criminal Justice Technology degree at St. Petersburg College is a 64-credit program that can be pursued online. Students must complete 24 credits from the criminal justice curriculum in addition to taking the following core courses: Introduction to Criminal Justice, Investigative Trends, Constitutional Law and Rules of Evidence, Crime and Delinquency, and Research Methods for Criminal Justice. An AS degree and a professional certificate program in crime scene technology are also available online. Students admitted to the Bachelor of Applied Science in Public Safety Administration program can select criminal justice as their sub-plan, or area of specialization. Coursework for this sub-plan includes corrections practice and policy, management of law enforcement units, and international organized crime. The College of Professional Studies at St. John's University offers a Bachelor of Science in Criminal Justice degree that can be completed online. Students are required to take 36 credits in the major, which includes courses in the American judicial system, theories of crime, and the correctional system. The program gives students the opportunity to specialize in forensic psychology. The completion of an internship or a research project is a requirement for graduation. Applicants who have completed training courses at the NYC Police, NYC Corrections, or Nassau County, Suffolk County or NYS Police Academies may be eligible to receive credit towards the degree. St. John's offers a 60-credit Associate of Science in Criminal Justice degree that can be completed online as well. Students who are interested in the criminal justice field can explore the Bachelor of Technology (B. Tech) programs offered by the State University of New York Canton in the following areas: criminal investigation, homeland security, legal studies, and criminal justice (law enforcement leadership). Only 50 percent of the courses for the criminal investigation program are available online. The remaining B. Tech degrees can be pursued entirely online. SUNY Canton also offers an Associate of Applied Science in Criminal Justice degree. A number of courses for this program are also made available online. The AAS degree has three tracks: law enforcement, corrections, and a generalist track. Criminal justice students have the opportunity to attend the St. Lawrence County David Sullivan Law Enforcement Academy. Tallahassee Community College offers an Associate of Science degree in criminal justice technology through the Division of Technology and Professional Programs. Students have the option of pursuing the 60-credit degree online. A minimum of 45 credit hours must be fulfilled by enrolling in courses from the criminal justice curriculum. The available courses cover a wide range of topics that include crime scene investigation, criminal evidence and procedures, the nature and causes of crime and delinquency, and contemporary criminal justice issues. Tallahassee Community College has articulation agreements in place with Barry University and the Florida Gulf Coast University for the AS in Criminal Justice Technology program. The agreement facilitates the transfer of AS credits to a four-year baccalaureate program in these universities. The University of Texas El Paso offers a Bachelor of Arts in Criminal Justice program with a unique focus on crime along the border of the United States and Mexico. The degree can be completed entirely online. In addition to the General Education courses (42 credits) and the Liberal Arts Block electives (18 credits), students must also meet the foreign language requirement (6 credits) of the Bachelor of Arts program. The criminal justice core requirements and electives make up the rest of the 120 credits needed to graduate from the program. Students are given the opportunity to study criminal justice issues such as correctional systems and practices, immigration law and administration, criminal justice organizations and management, and court systems and practices. Tiffin University offers online Bachelor of Criminal Justice programs in the following fields: corrections, homeland security and terrorism, justice administration, and law enforcement. Classes for these programs are offered in seven-week terms. There are six starting dates throughout the year, making the program convenient and flexible for students with work and personal responsibilities. A Master of Science in Criminal Justice is available online as well. The MS program has five areas of concentration. Three of these concentration areas (crime analysis, criminal behavior, and homeland security administration) are available completely online. The justice administration concentration follows a hybrid delivery system and is available online as well at the Brunswick campus. Only the forensic pathology concentration follows a face-to-face delivery format. Troy University's criminal justice program is one of the largest academic programs at the school, where the faculty has real-life experience in criminal justice. Online students can earn an undergraduate degree, master's degree, or certificate in cybersecurity. The bachelor's degree has three concentrations: homeland security, digital forensics, or cybersecurity. The curriculum includes 36 credits in the criminal justice major and another 12 credits in the concentration. The Master of Science in Criminal Justice has a 30-credit non-thesis option or a 36-credit thesis option. An optional concentration in security studies is offered. Applicants to the master's program must have a bachelor's degree with a 2.5 GPA overall or 3.0 for the last 30 credits and must submit GRE scores. Union Institute and University offers a Bachelor of Science in Criminal Justice Management degree that can be pursued online and completed following a full-time or part-time plan of study. The program has three start dates - January, May, and September. The curriculum includes coursework in topics such as applied ethics in criminal justice management, forensic science management, criminal justice administration, and information systems in criminal justice management. Union has a generous transfer credit policy; up to 90 semester hours may be transferred from related training programs and professional experience in the field. An extensive list of elective courses provide students with the opportunity to customize their degree by enrolling in classes that support their interests, as well as their academic and career goals. The College of Health and Public Affairs at the University of Central Florida offers online Bachelor of Arts and Bachelor of Science degrees in criminal justice. BA students must demonstrate a foreign language proficiency at a first year college level. All students are required to complete the following coursework: prosecution and adjudication, crime in America, corrections and penology, criminal justice systems, police and society, research methods in criminal justice, and data analysis for criminal justice. The university's Master of Science in Criminal Justice degree (professional track) is also available online. The program is comprised of 36 credits and emphasizes criminal justice theory, policy, research, and organizational administration. There is also a 12-credit Graduate Certificate in Corrections Leadership available online. The University of Cincinnati offers Bachelor of Science and Master of Science degrees in criminal justice, which can both be completed online. The bachelor program follows an interdisciplinary approach and gives students the opportunity to study several different aspects of the criminal justice field, such as crime prevention, child behavioral problems, adolescent delinquency, and effective intervention. Students accepted to the MS in Criminal Justice program can pursue a general track of study with no concentration. However, they also have the option of selecting an area of concentration from the following fields: analysis of criminal behavior, law enforcement and crime prevention, and corrections and offender rehabilitation. The MS program is comprised of 33 credits and can be completed in one to two years. The University of Houston Downtown (UHD) offers an online Bachelor of Science in Criminal Justice degree through the College of Public Service. This is a degree completion program designed for students who have already fulfilled the required lower-division coursework at another college. Students must complete a minimum of 36 upper-division credits at UHD, with at least 18 credits from the criminal justice curriculum. The university offers a Master of Science (MS) in Criminal Justice program that can also be completed online. MS courses are offered in five 8-week blocks each year. Students take courses in advanced criminology, quantitative analysis in criminal justice, policy analysis and program evaluation, and administration in criminal justice. The MS degree can be completed in just 14 months. The University of Maryland University College offers a Bachelor of Science degree in criminal justice that can be pursued online. Students learn about the theory and practice of the criminal justice system in the United States, including the courts, law enforcement, corrections, investigation, etc. In addition to completing the General Education requirements (41 credits), students must take at least 33 credits from the list of courses for the criminal justice major. Some of these courses include the following: security management, juvenile delinquency, victimology, drugs and crime, and ethical behavior in criminal justice. Students are required to choose a minor (15 credits) that will best complement their criminal justice program, such as emergency management, forensics, homeland security, or public safety administration. The Bachelor of Science in Criminal Justice program offered at the University of Massachusetts Lowell can be pursued entirely online or as a hybrid of on-campus and online coursework. Students enroll in courses such as criminal law, introduction to policing, the criminal justice system, criminology, and corrections. In addition, students have the option of attaining intermediate proficiency in a modern foreign language or completing four courses relating to statistics, information technology, or data analysis. A Master in Criminal Justice degree is also available online. Students can customize their learning experience by enrolling in electives (6 courses) that focus on their interests and support their career goals, such as domestic terrorism, forensic psychology, substance abuse, or criminal mind and behavior. The Henry C. Lee College of Criminal Justice and Forensic Sciences at The University of New Haven offers a 36-credit Master in Criminal Justice degree that can be completed in just two years. The program is available 100 percent online. Courses are offered in 6 to 7.5 week terms and students can begin the program at any term. The core curriculum includes the following courses: mental health, law, and criminal justice, theories of criminal behavior, research methods in criminal justice, and quantitative applications in criminal justice. Students can customize their program by enrolling in classes (24 elective credits) that support their interests, as well as their academic and career goals, such as computer forensics investigation, criminal justice policy, or criminal procedure. The Master of Science in Criminal Justice degree available at the University of Wisconsin Platteville is a 30-credit program that can be completed online. Students can select one of the following areas of specialization: criminal justice theory, criminal justice management, or victim and offender services. Working with a faculty advisor, students can also craft an individualized program of study by taking electives that focus on their interests and support their professional goals. Students can earn a 9-credit Child Advocacy Certificate as part of their MS degree. The curriculum covers a wide range of topics that are essential in the field of criminal justice studies today, including theories of personality in the criminal justice system, contemporary correctional systems, and juvenile delinquency and justice. The Bachelor of Science in Fraud and Financial Crime Investigation degree at Utica College is a baccalaureate completer program that is available online. Applicants must have an Associate's degree or at least 57 credits from a four-year institution to be considered for the program. The curriculum provides students with a comprehensive view of the criminal justice system and economic crime. At the current time, students have the option of specializing in two areas - financial investigation and in fraud prevention and detection. Utica College has partnered with the Association of Certified Anti-Money Laundering Specialists (ACAMS) to prepare its graduates for the CAMS certification exam. Students who complete the program are also eligible to take the Certified Fraud Examiner (CFE) test. Webster University's online wing has both a Bachelor of Arts in Criminology and a Master of Science in Criminal Justice. The former mixes core work in criminology with sociology, psychology and other disciplines. The latter takes a different tack, with students choosing electives from four themed clusters: the American-centric Administration of Justice cluster, the internally focused Security Studies cluster, the crosscutting Fraud Investigation cluster, and the Cybersecurity cluster. Students from the latter can also take all four courses from the Cybersecurity-Threat Detection cluster and walk away with a graduate certificate. The Bachelor of Science in Criminal Justice degree at Western Carolina University is an online degree completion program. To be considered for admission, applicants must already have an Associate degree or completed 44 credits that satisfy the General Education requirement for a North Carolina community college. Students accepted to the program are required to take at least 49 credits from the criminal justice list of core and elective courses. The curriculum includes coursework that cover a wide range of topics such as criminal procedure and judicial process, legal liability in criminal justice personnel, social justice and the law, and criminal justice policy. At the current time, there is only one area of concentration available online, which is administration of justice. The College of Social and Behavioral Sciences at Wilmington University offers a Bachelor of Science in Criminal Justice degree that can be completed 100 percent online. Students admitted to the program are required to take 45 credits of criminal justice core subjects and an additional 18 credits in approved electives for the major. The core curriculum covers a wide range of topics and includes courses in the principles of criminology, constitutional law, community corrections, administration of criminal justice organizations, and multicultural issues in criminal justice. The college offers a Certificate in Criminal Justice that is comprised of 30 credits and can also be pursued online. The certificate credits are fully transferable to a four-year bachelor's program in a related field. Already working in law enforcement, corrections, or the courts? Aiming to become a police chief, a lawyer, or a criminologist? Thinking about your post-military plans? An online program in criminal justice may be just the ticket for your career. And since it pays to do a little research, we’ve done it for you. Here you’ll find tips on choosing an online degree, transferring credits, gaining real-world experience, taking advantage of tuition breaks, and more. We also have handy summaries of the top online schools in our rankings for both quality and price. Unsure about your career path? 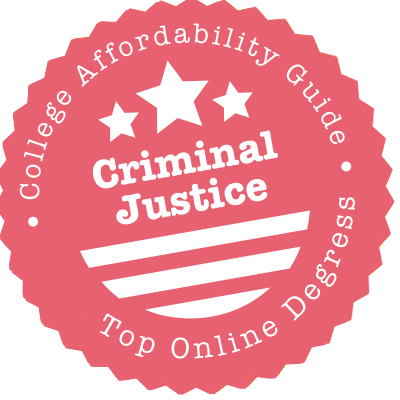 Check out the advice in our guide to Affordable Criminal Justice Degrees. We take a detailed look at each degree level, including typical coursework and the job opportunities that you’ll have upon graduation. We also discuss the differences between regional & national accreditation and provide a list of criminal justice organizations that you may wish to join. Do You Want an AS, AA or an Applied Associate Degree? Generally speaking, an AA or AS will set you up for a credit transfer to a bachelor’s degree and an AAS is designed to prepare you for entry-level jobs. But this is not a hard & fast rule! For example, Central Texas College’s Online AAS in Criminal Justice programs can be used for transfer, and South Texas College’s AA in Criminal Justice is workplace-ready. Read the degree descriptions carefully. Will Your Online Credits Transfer Easily to a BA or BS? Online course credits from a regionally accredited institution should transfer to a bachelor’s program, but it’s always best to check. Also, be aware that some community colleges have special arrangements with universities. For instance, students in Tallahassee Community College’s Online AS in Criminal Justice Technology get a streamlined credit transfer to Barry University and the Florida Gulf Coast University. And Ivy Tech Community College’s Online AS in Criminal Justice is a T-SAP (Transfer – Single Articulation Pathway) program, which means it will readily transfer to a four-year baccalaureate program in a related field. Can You Apply Credits for Career Experience? A lot of police & correctional officers earn their associate degree while they’re still at work. If this is your plan, it’s important to know that you may be eligible for career-based credits. For example, students who have graduated from recognized academies as police or correctional officers automatically receive 12 credits towards Hartnell College’s Fast Track Online AS in Administration of Justice. And at Brevard Community College, applicants who have completed the Florida Department of Law Enforcement (FDLE) Officer Competency Exam may be eligible for college credits. Talk to the program coordinator! What Do You Want the Degree For? You don’t need a bachelor’s degree to qualify for some criminal justice jobs. Police officers and youth case workers, for instance, may only have to hold a high school diploma or an associate’s degree. But a BA or BS can expand your career options in local and federal law enforcement, and help you advance in the ranks as a corrections officer, criminal investigator, victim advocate, parole or probation officer, etc. So it’s probably worth considering at some point. Remember that if you wish to become a police officer, you will still need to pass physical fitness tests and complete police academy training. Should You Choose an Online BS or Online BA? This will depend on your goals. An Online BS in Criminal Justice will typically have courses in social sciences, hard sciences, and technology. An Online BA in Criminal Justice will usually have more courses in foreign languages, sociology, psychology, law, and the like. If you’re planning for a technical career in criminal justice (e.g. forensic science, cyber security, etc. ), we recommend the BS. Talk to the career advisor at the university if you have any questions. Will You Gain Real-World Experience? Criminal justice is not a “watch the birds go by” profession, so we always favor online bachelor’s programs that include on-the-ground fieldwork. At Lindenwood University, for example, students in the Online BA in Criminal Justice program must complete an internship experience in order to graduate. Pay a visit to your university’s Department of Criminal Justice website. There will often be a webpage devoted to internships and local opportunities. Does the Program Have Unique Strengths? Online bachelor programs in criminal justice tend to be swimming in concentrations & electives, so you’ll have plenty of choice. You might decide to focus on technical specialties (e.g. cyber security, forensic science, etc.) or societal concerns (e.g. criminal law, criminal psychology, etc.). Plus, thanks to their location or field of expertise, some universities have unusual strengths. For instance, the University of Texas El Paso offers an Online BA in Criminal Justice with a focus on crime along the border of the United States and Mexico. Meanwhile, the Department of Criminology & Criminal Justice at Webster University puts an emphasis on interactions with special populations. Shop around! Is it a Degree Completion Program? Our list is a mix of traditional four-year programs and two-year “degree completion” programs for students who have earned their associate degree credits elsewhere. For instance, applicants for Florida State University’s Online BS in Criminology must already have an AA degree in order to be considered for admission. And the Online BA in Law and Justice program at Rowan University requires applicants to have an associate degree or 24 semester hours of transferable college credits. You could consider earning your AA or AS at an affordable community college and then transferring to an online degree to finish your education. What About Degrees with Other Titles? The field of criminal justice isn’t limited to criminology, law, and corrections. For example, Florida Atlantic University offers an Online Bachelor of Public Safety Administration—with specializations in law enforcement and disaster management—for students seeking a career in police, fire, and disaster response administration. Arkansas Tech University has an Online BS in Emergency Management and Utica College has an Online BS in Fraud and Financial Crime Investigation. It’s worth expanding your search. Can You Apply Academic & Career Credits? Universities will often allow you to apply previous academic & career credits toward a bachelor’s program. For example, applicants to St. John’s University’s Online BS in Criminal Justice may be eligible to receive credit for training courses at the NYC Police, NYC Corrections, or Nassau County, Suffolk County or NYS Police Academies. The more credits you can apply to your bachelor’s degree, the lower your overall cost will be. Take advantage of every credit transfer opportunity. Does it Prepare You for Law School or Graduate Work? You may want to use an online bachelor’s program in criminal justice as the starting point for law school or a specialist master’s degree. For instance, Chaminade University’s Online BS in Criminal Justice has a pre-law track and UMass Lowell’s Online BS/MA program helps students complete both degrees at an accelerated pace. Remember, too, that you don’t have to decide on your goals immediately—Central Washington University’s Online BA in Law and Justice will prep you for jobs in law enforcement & corrections and lay the groundwork for graduate studies and law school. Does it Prepare You for Certifications? Professional certifications can burnish your résumé, so it’s always great when universities are willing to help you train for them. For instance, Utica College has partnered with the Association of Certified Anti-Money Laundering Specialists (ACAMS) to prepare graduates of its Online BS in Fraud and Financial Crime Investigation for the CAMS certification exam. Students who complete the program are also eligible to take the Certified Fraud Examiner (CFE) test. What Do You Want the Degree For? Graduate-level programs in criminal justice are often geared toward senior officers and supervisors (e.g. corporate security manager); folks who are training for a particular career (e.g. government policy, law, etc. ); or students who want to qualify for a specialist position in law enforcement (e.g. criminologist). Police officers and detectives don’t usually need a master’s degree, but police chiefs and captains might. Before you lay your money down, talk to your mentors and employer about your goals. Does it Have Career-Focused Concentrations? Two of the most popular graduate concentrations are law enforcement and corrections. But this is just the start! For example, Southern New Hampshire University’s Online MS in Criminal Justice has concentrations in advanced counterterrorism and in public safety administration. Meanwhile, Tiffin University’s Online MS in Criminal Justice has concentrations in crime analysis, criminal behavior, and homeland security administration. And at Webster University, the Online MS in Criminal Justice includes four clusters: administration of justice, security studies, fraud investigation, and cybersecurity. Just make sure your chosen electives will be available online. Do You Wish to Focus on Leadership? In our list, you’ll find a subset of online graduate programs that are devoted to management training. Examples of this phenomenon include Liberty University’s Online MS in Criminal Justice – Public Administration; Eastern Kentucky University’s Online MS in Justice, Policy, and Leadership (students can choose concentrations in police, corrections, or juvenile justice); and Sam Houston State University’s Online MS in Criminal Justice Leadership. As the titles suggest, these degrees can be relevant if you’re applying for a position as a police chief, leading a corrections facility, and so on. What Makes the Online Program Unique? Strong universities try to make their online graduate programs stand out by adding “one-of-a-kind” aspects. For instance, student’s in the University of Wisconsin-Platteville’s Online MS in Criminal Justice can earn a 9-credit Child Advocacy Certificate as part of their degree. If you’ve got the time, it’s also worth exploring your school’s Department of Criminal Justice website to see if the department has strengths in particular areas (e.g. criminology, juvenile justice, law, etc.). Does it Appear in Online Criminal Justice Rankings? Every year, U.S. News & World Report ranks the Best Online Criminal Justice Graduate Programs in the country. The great thing about these rankings? You can dig down into the university’s profile and discover info on admissions criteria, faculty, graduate debt, and much more. It’s an excellent way to view the degree in a nutshell. Is it Worth the Investment? Most PhD or DCJ programs are designed to prepare you for university teaching, research work, a career in administration (e.g. social policy), corporate management, or top-level jobs in criminal justice (e.g. expert criminologist, correctional leadership, criminal consultant, etc.). You’ll know when you need one. The trick is to decide if you can handle the workload via distance learning. Doctoral work can be lonely and frustrating, so it’s important you have easy access to your PhD advisor and research materials. Can You Find One? Online doctoral programs in criminal justice exist—Nova Southeastern has an Online PhD in Criminal Justice and Colorado Technical University has an Online Doctor of Management: Criminal Justice Concentration—but they are quite rare. You may also find the price is equivalent to a program closer to home. Compare your options carefully. What Area Do You Want to Specialize in? Short and sweet, online certificates in criminal justice are designed to train you in specific fields or move you up the job ladder. To take a couple of examples: the University of Central Florida offers an Online Graduate Certificate in Corrections Leadership and Saint Leo University has an Online Graduate Certificate in Criminal Justice Management. Can You Gain Technical Skills Online? In a few cases, you may find that the certificate program will provide you with specific technical skills. For instance, St. Petersburg College offers an undergraduate Professional Online Certificate in Crime Scene Technology for aspiring crime scene technicians. The coursework includes training in biological evidence, crime scene photography, forensic science, and more. Will Your Credits Transfer to a Degree? Always check to see if your online credits will transfer smoothly to a criminal justice program (online or on-campus). You may not want a degree now, but you don’t want to repeat courses if you choose to apply for one later. For instance, credits for Wilmington University’s Online Certificate in Criminal Justice are fully transferable to a four-year bachelor’s program in a related field. Can You Enroll if You Live Out-Of-State? Most universities have reciprocity agreements that allow students from other states to enroll in distance learning programs. However, you may find that your state is one of the exceptions to the rule! Reciprocity problems tend to pop up with programs that have clinical & on-the-ground components (e.g. nursing, education, counseling etc. ), but it’s always best to check. Florida Atlantic University and Rowan University, for example, have entire sections on State Authorization Compliance. Does the Program Fit With Your Schedule? Because criminal justice students are often already employed in law enforcement, lots of universities try to make online programs easy on working professionals. That means your online criminal justice degree could have multiple start dates, shorter terms, and asynchronous classes (i.e. there’s no need to log in at a certain hour). On the other hand, if you choose a program like North Carolina Central University’s Online BS in Criminal Justice at Wake Tech, you’ll need to attend a five-week summer session at Wake Tech’s Public Safety Education Campus. Research the time commitments. What is the Credit Transfer Policy? As we’ve mentioned, you may already have credits that you’d like to transfer into a degree, especially credits for prior work experience & training (e.g. police training transcripts). Every university has its own credit transfer policy, so you’ll have to spend a little time with the website. For instance, at Excelsior College, students are allowed to transfer up to 57 credits to the AS in Criminal Justice; some types of military training or work experience may qualify for academic credits as well. When in doubt, ask the program coordinator. Who is Teaching Your Online Course? We believe this is a critical factor when it comes to a practical field such as criminal justice. Who wants to be stuck with a professor who has no real-world experience or understanding of current issues? Don’t trust the faculty summary on the program website—check the course schedule to find out who is teaching your core courses and chosen electives. Are they working in the field at the moment? Do they have a LinkedIn profile? What jobs have they held in the past? Is the Coursework & Training Relevant? Strong online programs include elements that you can start immediately applying to your current job. Think technical courses like crime mapping or data analysis. Think training in interviewing techniques and criminal profiling. Think internships in another agency. For instance, students in Wilmington University’s Online BS in Criminal Justice have the option to take part in a co-op program, which allows them to get supervised work experience while earning credit towards their degree. How Does the Program Support Online Students? Distance learning can be tough, especially if you’re not used to the technology. We favor online programs in criminal justice that support students throughout the entire process. For example, resources for online students at Pennsylvania State University include undergraduate advising, career counseling, exam proctoring, tech support, and tutoring in writing and math. Are There Hidden Costs? Check the tuition & fees page very carefully. Even if you don’t have to pay for campus facilities, universities and colleges often tack on fees for distance learning or technology. You may also be expected to pay for materials (e.g. textbooks) or travel to work sites or the campus for on-the-ground experiences. Draw up a comprehensive budget. Is Financial Aid Available to Online Students? Most online undergraduate programs will qualify for financial aid (e.g. loans, grants, scholarships, etc. ), but it’s always best to check with the Office of Financial Aid. If you’re at a regionally accredited school, your online graduate degree will typically qualify for aid packages (e.g. federal graduate loans), but non-degree programs like graduate certificates will not. Again, talk to the Office of Financial Aid and be sure to consider external funding options (e.g. outside scholarships, employer reimbursement programs, etc.). What Can the University Do for Military, Veterans or Police Officers? Lots of universities offer tuition discounts, fee waivers, scholarships, and special funding for folks who have served their country or community. This is especially true when it comes to online criminal justice programs, which are popular with law enforcement professionals. You may be able to save a huge amount on the final cost. Do Online Students Receive a Tuition Discount? Public and state universities often offer big tuition breaks to online undergraduates (and sometimes to graduates) who reside in the state or in neighboring states. Other universities give tuition discounts to online students regardless of their location. Policies vary between schools, so visit the tuition & fees page for details. If you have any concerns about a university offering an online program in criminal justice, check the state where the university is located and then have a look at our Online State Rankings. Under each state, we have a detailed list of Online Schools with Accreditation & Quality Concerns. The following universities appear in our rankings of Top Affordable Schools for Criminal Justice and Top Online Schools for Criminal Justice. That means they have met some extremely tough criteria for quality, flexibility, price, and use of financial aid money (you’ll see a CAG Score next to their profiles). Tuition & mandatory fees for off-campus undergraduates are listed by the Office of the Registrar. Washington State residents receive a hefty discount on per credit tuition, especially up to 18 credits. Financial aid is available. We also recommend a look at the section on institutional gift aid, which lists options such as the Veteran Dependent Waiver, Central Veteran Grant, and the Tuition Waiver for Dependent Students of Disabled or Deceased Fire or Police. But wait, there’s more! CWU’s Scholarship Office has a large list of scholarships, both internal and external. Washington State women should be sure to check out the Women in Law Enforcement Scholarship; folks with financial need can apply for the Amy Marie Castner Scholarship. The Department of Law and Justice also lists internship information & job opportunities and details about the Sergeant Nelson K. Ng Inspiration Award for LAJ graduates. FAU’s College for Design & Social Inquiry is responsible for administering the Online BA in Criminal Justice and the Online Bachelor of Public Safety Administration. Tuition & fees for these degrees are laid out in the tuition breakdown. Florida residents pay much less in per credit tuition than out-of-state residents! The Financial Aid Office can assist with federal aid applications, loans, and grants. FAU even has a Linkage Institute Tuition Waiver for residents of certain foreign countries. You’ll find the latest on FSU’s Online BS in Criminology and the Online MS in Criminal Justice Studies at the College of Criminology & Criminal Justice. However, tuition & fees for distance academic programs are posted by Student Business Services. Florida residents, whether they’re undergraduates or graduates, get a major tuition discount! An out-of-state online master’s students qualify for reduced market rate tuition. The Office of Financial Aid is ready and able to assist with aid applications & scholarships. But we also wanted to point out that FSU has a great Relgalf Scholarship for Current Police Officers who want to pursue the Online BS in Criminology. FSU will pay your tuition & fees in exchange for three years of service in a small police department (fewer than 21 officers) as a sworn officer after graduation. Applicants must have an AA degree from a Florida community college. * A couple of caveats on the Online BS program: Since the online undergraduate courses are not state-funded, independent living and state employee tuition waivers do not apply. Also, you cannot pay for online undergraduate classes through the Florida Prepaid College Plan. Rowan’s tuition & costs are outlined on the Rowan Global website and on the program pages for the Online BA in Law and Justice (degree completion) and the Online MA in Criminal Justice. Tuition rates are the same for residents and non-residents of New Jersey. All Rowan Global students, whether full-time or part-time, are charged per-semester hour; there are no extra fees. Rowan Global has separate sections for Undergraduate Financial Aid and Graduate Financial Aid. Adult learners pursuing graduate studies are eligible for the Rowan Global Scholarship. And the Department of Law & Justice Studies has information about local internship opportunities. Do you live in the NJ area? If you decide to attend Rowan College at Burlington County (RCBC) to earn your initial academic credits, you may be eligible for a 15% discount on tuition and a waiver on the application fee. You’ll discover all of UCF’s criminal justice offerings on UCF Online. It has a complete rundown of Undergraduate Tuition & Fees and Graduate Tuition & Fees. Undergraduates and graduates who are residents of Florida receive a substantial tuition discount! Online students receive a waiver on some campus-based fees, but distance learning fees still apply. The Office of Student Financial Assistance has the skinny on grants, loans, and aid, including UCF’s all-in-one Scholarships A2O application. Better yet, the Department of Criminal Justice has a number of specific scholarships open to criminal justice students. The Department has also developed a Career Roadmap and an extensive list of internship opportunities. UMass Lowell’s Division of Online and Continuing Education has the full details on its Online BS in Criminal Justice and Online MA in Criminal Justice, as well as its Online Graduate Certificate in Forensic Criminology. Tuition & fees are the same for in-state and out-of-state residents. As of 2018, UMass Lowell no longer offers state employees and their dependents a 50% tuition credit for online courses. My Financial Aid and Advice for Continuing Education Students are two places to look for guidance on financial aid applications. It’s important to note that Online and Continuing Education students (especially undergraduates) are eligible for a variety of general scholarships, as well as the Allan Roscoe Endowed Scholarship Fund. This fund supports undergraduate or graduate students pursuing a degree in Criminal Justice. UW-Platteville’s MSCJ program website spells out tuition & aid, including the cost per credit hour, for its Online MS in Criminal Justice. There are no payment plans offered for distance courses. You can run down the list of Distance Education Scholarships to see if you’re eligible for any of the funds. Veterans should also check out the separate section on State and Federal Veteran’s Benefits—the university is regarded as being military-friendly. Looking to get a jump-start on credits? UW-Platteville will apply credits for professional experience from UW-Madison’s Wisconsin Certified Public Manager Program and the AMU Graduate Certificate in Homeland Security to the MS. It accepts transfer credits from accredited universities, and it has a special transfer agreement with University of California-Irvine Extension. For the latest on WCU’s Online BS in Criminal Justice, visit the section on Distance and Online Programs. We should note that BS applicants must have an associate degree (or the equivalent) and at least one year of criminal justice experience before they can apply. Details on Tuition & Fees, Financial Aid, and Scholarships can be found under Admissions & Aid. As of Fall 2018, all undergraduate students, both residential and online, get the benefit of reduced student tuition costs as part of a state program called the NC Promise Tuition Plan. North Carolina residents get a big discount on tuition! Certain scholarship funds are also available for undergraduates majoring in criminal justice. Military or veteran? Visit Military Student Services. WCU has a military-friendly reputation and it offers a number of education benefits & scholarships to students who have served. When push comes to shove, we recommend that you opt for schools with regional accreditation. This accreditation is given to a school, not an individual department or program, so it encompasses both on-campus and online degrees. Earning an online qualification from a regionally accredited university or college will make it easier for you to transfer credits; qualify for federal aid; apply for student loans, scholarships, and tuition reimbursement; and gain acceptance into graduate programs. Many regionally accredited schools will not accept credits from nationally accredited schools. There is no specialized accrediting agency for criminal justice programs. But there are organizations that deal with the certification of criminal justice programs. Like accrediting bodies, these organizations evaluate degree programs using a set of rigorous standards. That’s what the Academy of Criminal Justice Sciences (ACJS) does. It certifies associate’s, bachelor’s and master’s degree programs in criminal justice. We want to point out that your online criminal justice degree doesn’t need to have ACJS certification—there are plenty of great programs that haven’t bothered with it. But it can be viewed as an extra marker of quality. For example, the criminal justice programs at North Carolina Central University and Pennsylvania State University have met ACJS academic certification standards. Find an ACJS Certified Program.